I had the great fortune to close out the last week of May 2015 with my first BMW club drive. Sponsored by BMW CCA, Puget Sound Region, it was the first tour drive over these particular roads, and it was spectacular. We traveled down from Tacoma and took the windiest, most scenic and least direct route possible to a little town called Stevenson over at the Columbia River Gorge, stopping at Astoria in Oregon for lunch. After a half-hour of debating my future vehicle purchases, a short meeting was called and it was time to set off. My car was nestled between a spotless convertible E36 M3; a perfect car for the weather and a beautiful early-model Z4, with the few stubborn clouds above it crisply reflected over its deep-blue hood. The air filled with the sounds of waking engines as I neared my 330Ci. My thumb was pressed against the key so that all the windows would be open when I got in, and a flick of the ignition gave me the familiar growl followed by a low, calm purr. I was ready. My car was ready. In the passenger seat, my girlfriend was ready. 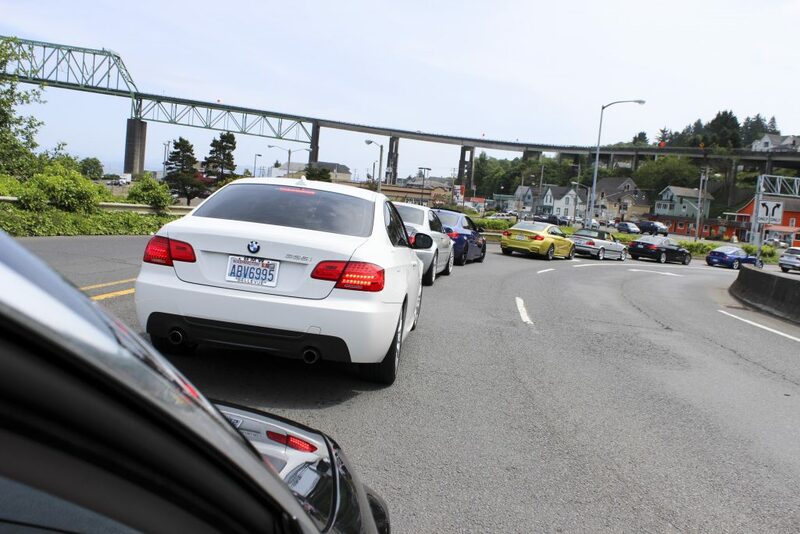 With twenty-five BMWs at attention, we were split into two groups, and soon I was following a silver E46 through the Tacoma roads. The etiquette took me a few turns and merges to get down. I had been told that as long as we were following the lead car, it didn’t matter if our cars got out of order or if we stayed in line. I soon found out, through several tricky merges involving a few semi-trucks and a line of BMWs behind me, that the car in my rear view was insistent on staying firmly planted there, no matter how inconvenient it may have been for them. I continued forward, paying attention to that E46 in front, but also to that Z4 still behind me, making sure that I didn’t do anything to make their life unduly difficult. 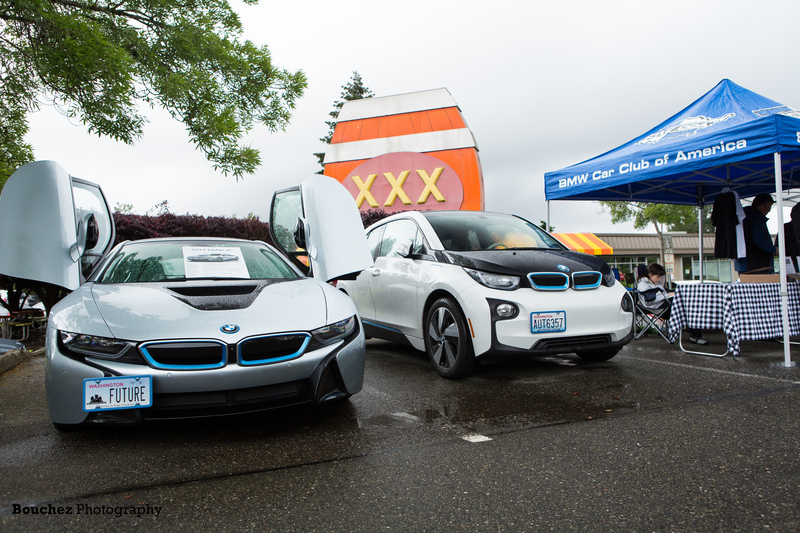 After a nice warm-up drive on I-5, BMWs proudly cruising past those more destination-focused drivers, I felt more confident and comfortable as one of the line-up. Just passed 30 miles on the tripometer, my copilot warned me of an upcoming merge onto highway 101, and then to the beautiful Washington 8. It was as though we were being slowly eased into the scenery, starting with the warm morning sun just cresting the never-ending trees lining the highway. Still our entourage pressed on, and over the long, slow curves I could see many more BMWs ahead, snaking their way one by one out of view. Many comfortable miles sped by this way, but the weather began to lose patience. Clouds came in suddenly and with them a rather sudden chill. Windows came up and convertibles closed as we reached our first pit-stop in McCleary. This stop was the first real chance I got to talk to the other drivers. 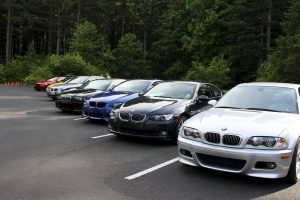 As is usually the case with car people, everyone was excited to talk about their cars, and about the other events they had recently attended thanks to BMW CCA. The hospitality was wonderful, and it was great to feel so quickly welcomed into the ranks. I learned that similar drives happen every month during the summer, and also a little about some of the dyno events and professional driving classes that people had taken to be more confident on the road and on the track. The fifteen-minute break was over in a flash and soon I was back on Washington 8, very content but looking forward to learning more about the BMW culture. The rest of the drive to Astoria was amazing. The weather soon cleared back up and the roads that the organizers had chosen were perfect. 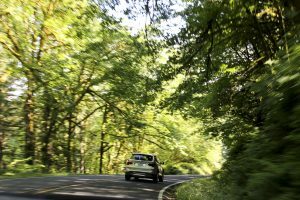 We passed myriads of beautiful scenery; we saw lakes nestled under steep embankments, we drove through magnificent forests, and we got some views of the Puget Sound that reminded us just how lucky we are to live here in Washington. My copilot’s only complaint was that we couldn’t stop at the viewpoints along the way, and I found myself wishing that we could as well. Too soon we were rounding the corner toward the Astoria Bridge, speeding toward Oregon across the great mouth of the Columbia River. Seagulls floated effortlessly by on the wind rising up against the bridge and just before we passed through bridge construction, we got a fantastic view of the city of Astoria, where we were stopping for lunch. Mere moments later, a parking lot near the water was full to the brim with BMWs. Our tour guides had several great spots picked out for lunch, and no one had any complaints about the food. My girlfriend and I, having been to Astoria before, opted for Charlie’s Chowder House, attached to the Tiki Bar. Charlie’s had been great to us in the past and that day was no exception. We were joined by two new friends we had made in McCleary, and looking longingly at the bar, I opted for a malted milkshake since I was, after all, driving. It was a fantastic stand-in for my usual Mai Tai, and I couldn’t pass up a Mako shark burger (how often do you get to eat shark?). It was phenomenal, as was my girlfriend’s BLT (what large strips of bacon you have). Our gentleman companion’s shrimp salad was given a raving review (after, of course, he’d found the salad under the colossal pile of shrimp), as was the gumbo ordered by his wife. Each couple shared a clam chowder, which was really more of a perfectly-seasoned clam stew with potatoes and more thick-cut bacon. Yes, I am taking an entire paragraph to describe our lunch, because it was just that good. If you haven’t eaten there, go eat there. Anyway, yes, lunch was amazing. Topped off and ready to go, our troupe headed off once more, this time aimed east toward the small town of Stevenson. On the way we passed a gas station for those whose petrol was running thin, and I took the opportunity to grab some teddy grahams whilst my lovely copilot used her photography talents to catalogue the wonderful sight of so many BMWs lined up together. The next stretch of our drive was the most spirited; we found ourselves winding around Lewis River Road, against more breathtaking views, but this time the road weaved back and forth against the river and our leader was, while certainly not reckless, having a lot of fun with the corners. Of course, in keeping up with him, we were all having a lot of fun with the corners! This was exactly how BMWs were built to be driven; seamlessly soaring along a winding trail picked out by a meandering river. It was perfection. All great roads must come to an end, and at the end of this one we stopped once more behind an ice cream and coffee house called RJ’s Coffee Shop, whose owners were kind enough to let us use their lot. Everyone was elated after the riverside drive; as my girlfriend and I enjoyed the sun filtering in through the trees and down onto the grassy field, we excitedly discussed the details of our experience. Every BMW had handled the drive a little differently, and every BMW had handled it well. These are cars that love to be driven as much as we love to drive them, and I got the sense that my E46 was as excited to get going again as I was. After some down time, I was back in the driver’s seat, coddled by leather, wood-grain gleaming happily at me in the sunlight, and my engine once again purring and ready. Our cars filed out for the last stretch of our journey. We made a beeline back to the Columbia River, passing interesting towns (Battle Ground was strangely peaceful) and finally finding our way to Washington 14, riding up alongside the river and enjoying the scenery all the way to Skamania Lodge in Stevenson. More curves and splendid scenery welcomed us, and when we finally arrived at the lodge for dinner and drinks, it was every bit the perfect end to a perfect day. Long line of BMWs in the lot, stiff drinks and good food with impeccable company; I simply can’t wait for the next drive. As a final note, Stevenson (and the area around it) has quite a bit to offer for the relaxed day traveler. We found an incredibly hospitable couple who hosted us through Airbnb, and not only were the accommodations comfortable and clean, but breakfast was made fresh with eggs from their chickens, bread baked the same morning and vegetables grilled to perfection. There was even honey that had come from bees on their farm, and it was just unbelievably good. We found amazing scenery in every direction. We crossed the Bridge of the Gods to see the Cascade Locks and the waterfalls mentioned on the tour email, and they were every bit as magnificent as we were led to believe. We were also told about the Mt. Hood scenic loop, which unfortunately we were not able to take, but I’m certain it’s a spectacular drive and I hope for the opportunity to take it in the future. Our guides hadn’t once steered us wrong.